Dartford [Summer] Tweetup. Friday 25th July. St Edmund’s Pleasance. The next Dartford Tweetup will be a picnic! No… literally… a picnic. We are trying to offer something a bit different from the usual “bunch of blokes in a pub” perception. And to be fair that is what we have often been! A picnic offers something a bit more family friendly and I’m planning to be there from about 6pm myself, to start the weekend. If the great British summer does live up to its reputation and we get a shower or two, then there is still the option to retreat to The Foresters in Great Queen Street. So that’s Friday 25th July at St Edmund’s Pleasance, Dartford – from about 6pm onwards... [DA1 1RZ] until midges, darkness, temperature etc, drive us away. Bring something to eat, or even to share, some refreshments and perhaps something to sit or recline on. Maybe even bring your family. We will, of course, look after the place. 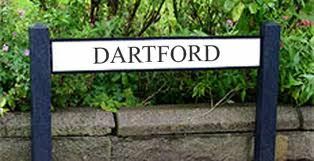 Since about half the regulars are also @dartfordlp litter pickers – we will probably end up making a total net reduction in the amount of litter there!